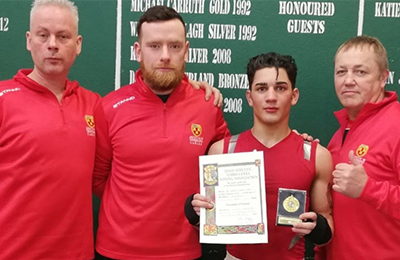 Local boxer Eoghan Chelmiah is celebrating after winning a gold medal for Institute of Technology Carlow at the recent IATBA National Championships. The Irish Athletic Third-Level National Championships (IATBA) brings together the cream of third-level boxers to the National Boxing Stadium each year. Eoghan earned his place in the Intermediate 60kg final and impressed the crowd with a calculated display of skill and footwork earning him the title of National Champion. Michael Treanor (69kg) was the second Institute of Technology Carlow boxer to compete at the Championships; however, after an enthralling semi-final encounter over 3x2 minute rounds, Michael narrowly lost out to his Cork IT opponent on a split decision. Institute of Technology Carlow Boxing Club, which is celebrating its 20th anniversary, continues to grow from strength to strength. The Showdown in the Barrow, its annual tournament organised by coaches, staff and students, is now one of the main sporting events on IT Carlow’s sporting calendar. The annual event attracts over 400 spectators, with competitors attending from third-level colleges and universities, including Waterford IT, Dublin City University and University of Limerick. This year’s Showdown in the Barrow saw 13 highly competitive bouts. The coveted Boxer of the Night award was deservedly won by IT Carlow’s Eoin Abbey-Maher for his impressive display in claiming an unanimous decision victory over DCU’s Daniel Forde in an intense and highly competitive fight in which both fighters showed impressive skills, grit and stamina. The event has generated much hype in recent years, claiming the Student Sport Ireland award for Best Third-Level Sporting Event 2016, and this year’s event reached the heights of previous years and continues to be one of the highlights of the Irish third-level education boxing calendar. Institute of Technology Carlow Boxing club thanked the IABA referees and judges on the night for their assistance as well as the Institute’s boxing trainers Andy Larkin, Mortimer Heaton and Jake Mc Nally and the many people who helped in organising the event. “Institute of Technology Carlow would like to thank all of the sponsors involved, including IT Carlow Students Union, Chantwells Catering, AIB bank, Carlow Cabs, Donegal English Language School, Portbeg Holiday Homes, James Kealy Planning and Design Services, Tully’s Bar, JR Mason NY, Mobile Book-keeping Solutions, Long Financial, TFM Electrical and Raging Bull Boxing Club. Their generosity ensures the event can continue to be a success. We would also like to thank local boxing club Raging Bull, Paulstown Boxing Club, Top Pro Carlow and Laois/Kilkenny Carlow County Board for all their support”, commented Donal McNally, Head of Sport for Institute of Technology Carlow. Caption: Eoghan Chelmiah (3rd from left) who won gold for Institute of Technology Carlow at the recent IATBA National Championships is pictured with the Institute’s boxing trainers (l-r) Mortimor Heaton, Jake McNally and Andy Larkin.